5 March 2019, Singapore - Set against three days of non-stop race action and stellar entertainment, the legendary Singapore Formula 1 Paddock ClubTM astounds yet again with a slew of signature haute cuisine at bespoke specialty concept restaurants at the FORMULA 1 SINGAPORE AIRLINES SINGAPORE GRAND PRIX 2019 this 20, 21 and 22 September. Headlining the quintessential Formula 1 Paddock ClubTM gastronomic experience this year is The Hind's Head by Heston Blumenthal, in the acclaimed chef's debut culinary showcase in Singapore. Recognised as one of the world's best and most influential chefs of his generation, three-Michelin starred Heston Blumenthal is known for his creative take to food pairing as reflected in the cuisine at his globally-acclaimed restaurants in the United Kingdom and Melbourne, including one of the world's best, The Fat Duck. Featuring a modern standout menu of traditional English fare served with a twist, the one Michelin-starred gastropub The Hind's Head, Bray will present indulgent signature dishes such as Lapsang Souchong Tea-Smoked Salmon with sour cream butter, caviar and soda bread, Veal Chop with celeriac puree, glazed carrots and sauce reform as well as Roasted Scallops with scallop tartare, white chocolate foam and caviar. Poised to return to the Singapore Formula 1 Paddock ClubTM for another successful year is NOBU at The Boardwalk, led by award-winning Chef Nobu Matsuhisa. The menu will feature signature dishes synonymous with masterful techniques and Japanese flavours with a hint of Peruvian influence and picture-perfect presentations..
Spanning five continents and multiple cities, including New York, London and Kuala Lumpur, the NOBU brand continues to receive rave reviews from publications like the New York Times, Zagat Surveys and Michelin Guide. As one of Australia's most influential chefs, Perry leads the highly-acclaimed Rockpool Dining Group including the Rockpool Bar and Grill's restaurant which has been ranked as one of ‘The World's 50 Best Restaurants' for seven consecutive years. A signature in the gastronomic offering is COMO Cuisine in partnership with Culina. Offering contemporary dishes with the signature COMO balance of flavour and originality, developed in partnership with fine food purveyor Culina, the menu will showcase exclusive ingredients such as Manjimup Truffle, Kaviari Kristal© Caviar and Wylarah Wagyu Beef. The star-studded culinary line-up will also feature signature restaurants from the COMO Dempsey family in their culinary showcase at the night race – Candlenut, Singapore's first Michelin-starred Peranakan restaurant, Ippoh Tempura Bar by Ginza Ippoh as well as nahm, COMO's Michelin-starred restaurant in Bangkok. At the vibrant heart of the Paddock Club sits the Boardwalk which not only features front-row views of all the on-track racing, but will house the delectable line-up including NOBU, Stockton Bar by Maximal Concepts and Tarte by Cheryl Koh. Guests can also indulge in a range of signature sweets made with the finest ingredients at Tarte, led by pastry chef Cheryl Koh of two Michelin-starred Les Amis Restaurant. Adding to the line-up is Stockton Bar by Maximal Concepts from the heart of Hong Kong. Ranked #8 among Asia's 50 Best Bars, it is an ode to Hong Kong's colonial past and the halcyon days of 1890s London. Go on a tippling experience like no other with Stockton's famed signature cocktails including Ribston Apple, Green Valley, Renegade and Brass Monkey. 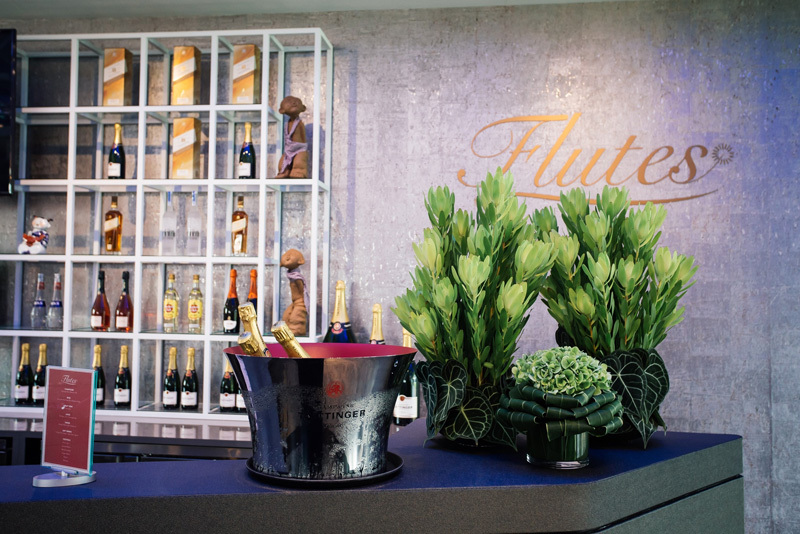 Add sparkle to the evening with chilled champagne at the Flutes bar for an exceptional Singapore Formula 1 Paddock ClubTM welcome experience. Guests can also look forward to amazing flower installations by celebrity florist, Nicolai Bergmann. At the frontier of flower artistry, the internationally acclaimed Bergmann unites the floral design principles of Europe with Japanese sensitivity to detail. The Singapore Formula 1 Paddock ClubTM is the epitome of luxury as guests will not only enjoy the tantalising epicurean cuisine, but will also be upclose to all the on-track action at the bespoke Paddock Club Grandstand and partake in the exclusive coveted Pit Lane Walk to see the cars and crew at their garages as they gear up for the race. In addition, Paddock Club guests will be able to enjoy a glittering display of fireworks at the rooftop oasis perched atop the Pit Building at the Paddock Club Sky Deck and take part in activities like Clairvoyant readings, escape the hustle and bustle to an oasis of calm at the spa and enjoy exclusive entertainment at the Paddock Club stage – all bound to offer a multi-sensory feast. Guests will also be able to enjoy this year's spectacular entertainment line-up which will feature performances by Swedish House Mafia, Muse, Red Hot Chili Peppers, Cardi B, Fatboy Slim, Hans Zimmer, Toots and The Maytals and many more. The Singapore Formula 1 Paddock ClubTM - A destination in its own right. The Singapore Formula 1 Paddock ClubTM ticket is available for purchase at SGD 8,880 (excluding tax) per person for a three-day package. Bookings and enquiries can be made online at www.singaporegp.sg , via the hotline +65 6731 5900 or by email at hospitality@singaporegp.sg.